This mosaic of the new high-resolution Pluto images shows 1,000 miles (1,600 km) of the dwarf planet's surface, as taken from 50,000 miles (80,000 km) away during New Horizons' closest approach. 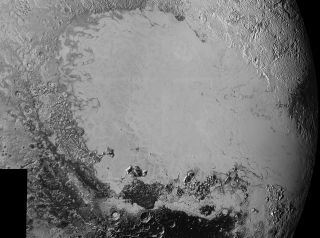 NASA's New Horizons spacecraft beamed home incredible new images of Pluto, scientists found a giant buried ice sheet on Mars and Elon Musk chatted with Stephen Colbert about the future of spaceflight. Here are Space.com's top stories of the week. Is this how we'll get samples back from Mars?